As soon as it was over I phoned my teacher and shouted “I made it through, I did it”! One definition of fear, in the Oxford English Dictionary is ‘a feeling of anxiety concerning the outcome of something’. 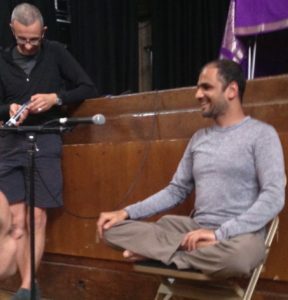 Somewhere back in March of this year I saw that R. Sharath Jois was doing another European tour. It coincided with me being given the last posture of Intermediate series, by my teacher. Somewhere in my crazy brain I thought it would be a good idea to sign up to his Led Intermediate class. I was very familiar with Led Primary not only with him but with my teacher too. At Yogabase Brighton we have Led Primary Series every Friday morning. On the morning I arrived in Camden having only slept for about 3 hours, terror was setting in. Most especially as I watched international yogis whom I follow on Instagram arrive one by one. At the commencement of the class Sharath announced before the opening mantra that unlike the Primary series, he would be stopping people throughout the practice if necessary. My knees started to shake from this point onwards. As Pasasana (the first posture of the Intermediate series) arrived we squatted down to the left side. Here a lady who could not bind got stopped straight away. The strictness and intensity of Sharath’s gaze grew stronger. The gateway postures of the Intermediate series are where we stayed for a while allowing Sharath a chance to see everyone in the class. Particularly at Dwi Pada Sirsasana. He walked through the rows of mats saying “do it again. Ok, you pass, you stop”. It was tough. By this point a large proportion of practitioners were seated at the back of the large hall with their mats. The protocol I learned, was that once stopped you waited until back bending to join back in again. I had a huge sense of achievement once we were through Karandavasana and I was still ‘standing’. Still with my eyes focused and adrenaline pumping I practised until the final counted breath. Lying in savasana I could feel lactic acid pumping through my veins. A sense of happiness and accomplishment was spread across my face. The method of Astanga yoga really does ask a lot. It’s a practice of dedication and observance. But after this experience I feel as though I could hear Pattabhi Jois asking the infamous question “why fearing?”..